Show your Canadian pride on the golf course with one of our Canadian Flag ball markers. 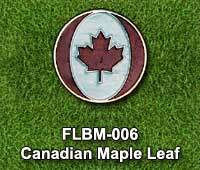 The traditional Canada and maple leaf on a white ball marker. 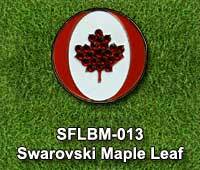 Canadian maple leaf on a white and red ball marker. The traditional Canada and maple leaf on a white golf ball marker with red Swarovski crystals on the maple leaf. 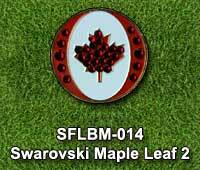 Our Canadian maple leaf on white and red background ball marker with red Swarovski crystals on the maple leaf and red background. 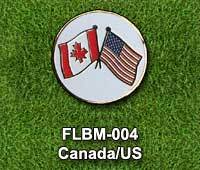 Friendly borders themed ball marker with the Canadian and American flags. 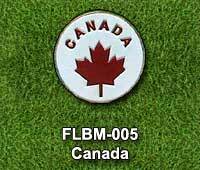 Canada Day and National Flag Day are both great times to use your Canadian flag ball marker on the golf course or on your hat. 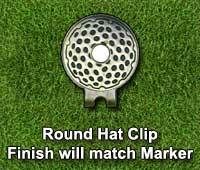 Select one of the ball markers and your choice of either a matching magnetic hat clip or golf ball marker shoe clip. Magnetic hat clip metal type is matched to the ball marker. 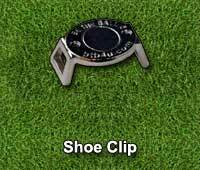 Shoe clip comes in nickel only. High quality Swarovski crystals used on our Swarovski versions of the golf ball markers. Our themed ball markers are shipped from the U.S.A. and are available for shipment to Canada and the Contiguous U.S.A. via the US Postal system. Normal Shipping Time: Our normal shipping time is approximately 3 working days to process the order plus shipping time. Local taxes (not shown on your invoice), customs and duty fees are not included. These are the responsibility of the purchaser at time of delivery. Shaped ball markers 1 1/16", 1 1/4"
Colors may vary slightly from images shown. Canada and the Contiguous U.S.A. via the US Postal system. Our normal shipping time is approximately 3 working days to process the order plus shipping time. to you asking for confirmation of your signup to our newsletter. Mailing Address: Surrey, BC Canada. 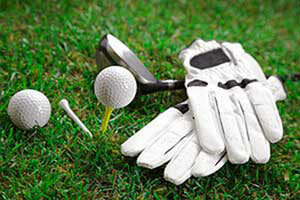 2012 - 2019 Copyright © Golf with Flair & our suppliers. All rights reserved worldwide.